Before I begin, I must apologize profusely for my delay in bringing you this installment of my Family Affair series. It resulted from a combination of issues–technical, medical, and practical–that are too boring to describe in detail. 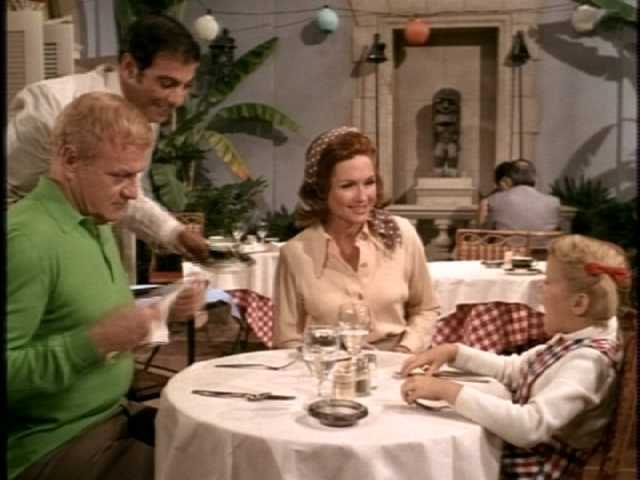 I think things are back on track now, and I will be able to blog about Family Affair at least every other week. 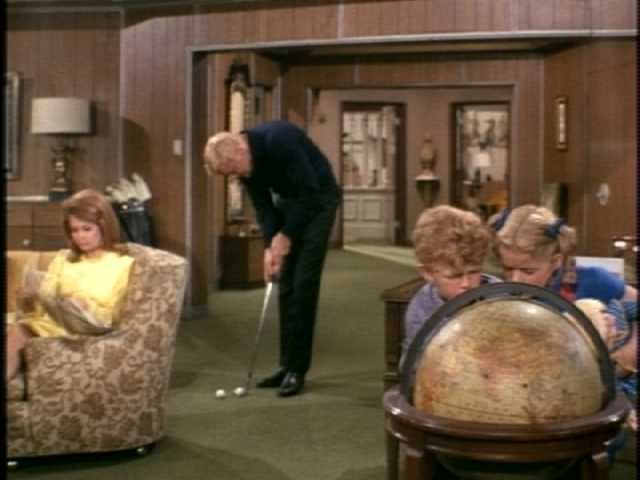 We find the Davis family in the living room, where Bill is practicing putting. Buffy and Jody are trying to find Puerto Rico on the map. Suprisingly, they do. Not so surprisingly, they think it looks so small that Bill could hit a golf ball all the way across it. Yes, Bill is getting ready to take another trip. He’s going to deliver a speech to an industry group, but golf and fishing also seem to be on itinerary. Jody waxes sentimental about the trips he and Bill have taken together. 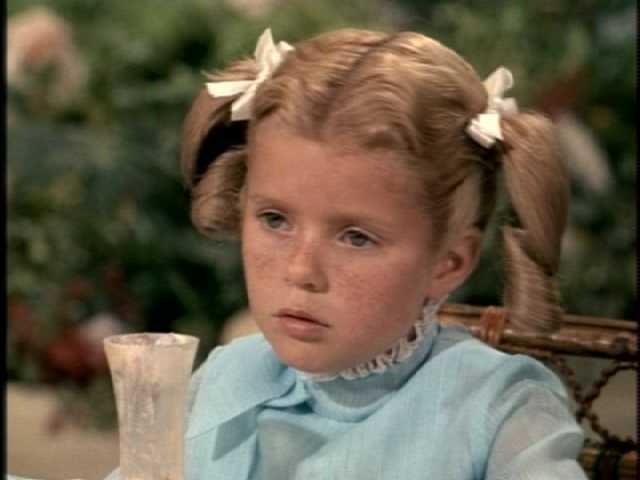 Realizing that Buffy has no similar stories to share, Cissy sports her concerned face. After Jody runs downstairs to talk to his stickball teammates, Buffy asks outright if she can go with him on fishing trip someday. This is how hopeful Buffy looks. He compounds his jerkiness by saying that little girls shouldn’t do rugged things. They should play with dolls instead. 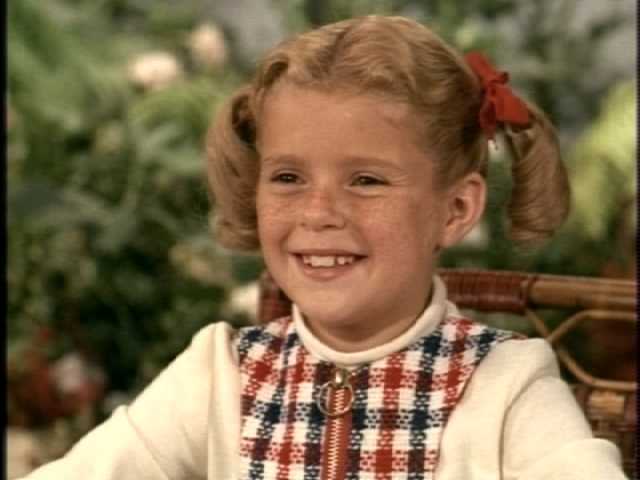 Cissy stalks off to her room, and a resigned Buffy takes Mrs. Beasley out on the terrace for a tea party. 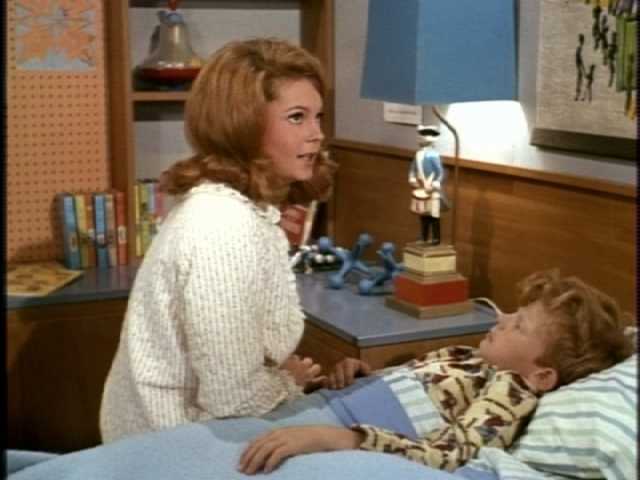 Moments later, Cissy shows Bill an essay Buffy wrote for school. It’s about a trip to Lake Placid with Uncle Bill. She tells the story from her point of view, even though she wasn’t really on the trip. “That is the best time I ever had, when Uncle Bill and I went away together just the two of us,” the essay concludes. Bill quickly comes to the conclusion that he should take Buffy with him to Puerto Rico for a long weekend. Good thing airplane reservations are so flexible in the Davises’ world. Buffy is thrilled to hear the news. French and Bill wonder if Jody will be jealous that Buffy gets to go and he doesn’t. In his usual good-natured way, though, Jody is delighted for his sister. Well, everyone is happy. What could possibly go wrong? Bill denies that he has such things in mind, but let’s face it: French always knows best. Bill and Buffy take a late flight, and Buffy is sleeping when they get to Puerto Rico. Bill’s wide awake, though, especially when he meets Gail. Gail is a writer for Corporation Magazine, which sounds like a scintillating read. She’s there to cover Bill’s speech, and she can’t wait to “interview him,” if you know what I mean. 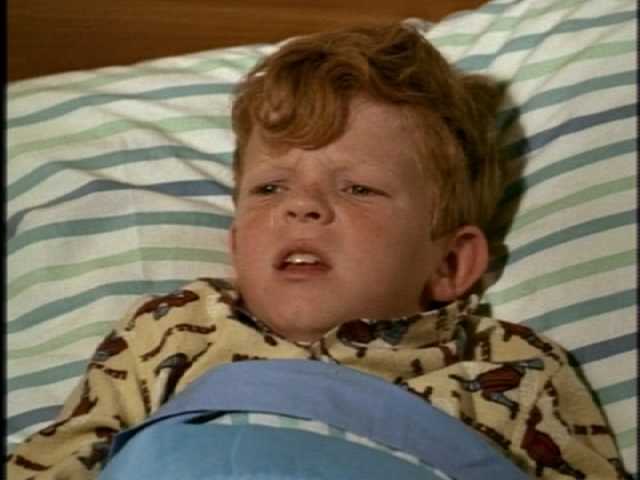 Bill’s associate thinks Bill should get a hotel babysitter for Buffy and head straight for the lounge. Showing some sensitivity, Bill decides that wouldn’t make for a good start to Buffy’s special trip. Random fashion note: Buffy’s coat and gloves are adorable in this scene. Meanwhile, at home, Cissy’s got a dating dilemma of her own. Cissy either has to cancel her date or take Jody along. I wonder which option she would prefer? This is how Jody looks when he realizes he’s going on the date. On their way to breakfast the next morning, Bill and Buffy meet the director of the hotel kids’ program. She’d be only too happy to take Buffy off his hands for breakfast, as well as a full day of activities. Bill mystifies the lady by preferring to eat breakfast alone with Buffy. He also wants to arrange a special activity for just the two of them. Mrs. Robinson suggests a burro trip to the old silver mines. At breakfast, Buffy is radiantly happy to have Bill’s full attention. Random fashion note: Isn’t Buffy’s outfit a little strange for a tropical climate? She doesn’t have his full attention for long, though. Buffy tells Gail that she’s pretty and then launches into a completely guileless recitation on all the pretty girls Bill knows–so many that he sometimes gets them mixed up. Bill’s discomfort is amusing to behold. Gail wants Bill to join her for golf, but he keeps his commitment to Buffy. 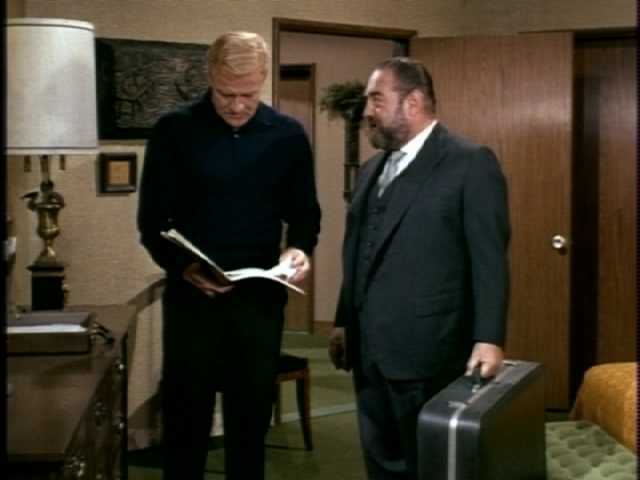 Back at home, Marvin Bradbury has big plans for his date with Cissy. 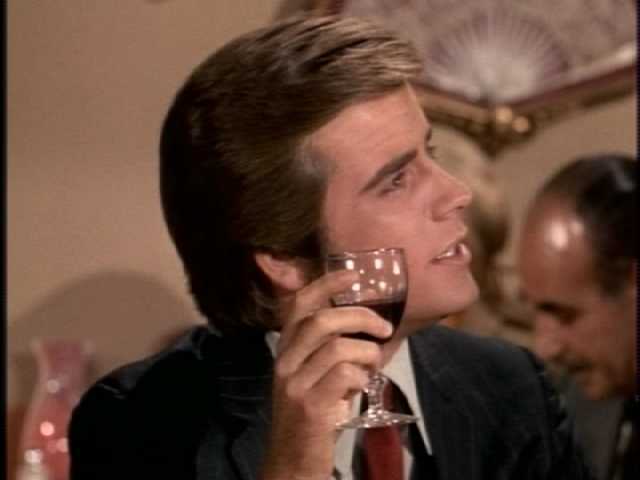 He’s arranged for a gypsy violinist and “wine”–actually, grape juice in a wine decanter. 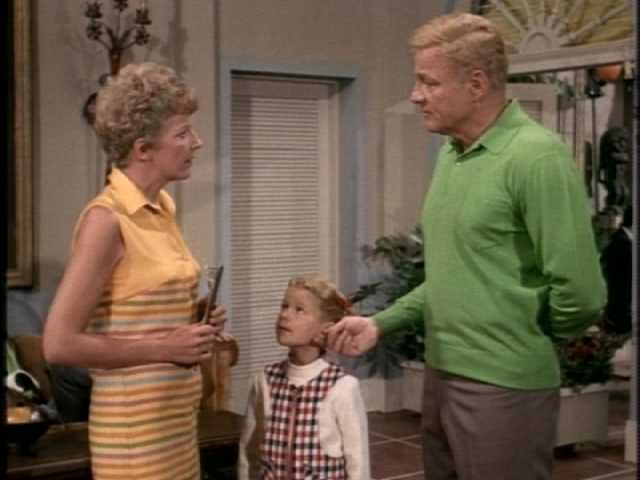 Cissy has neglected to warn him ahead of time that it will be a dinner for three, not two. This is what Marvin looks like when he meets Jody. Jody points out that it’s fruity because it’s grape juice. 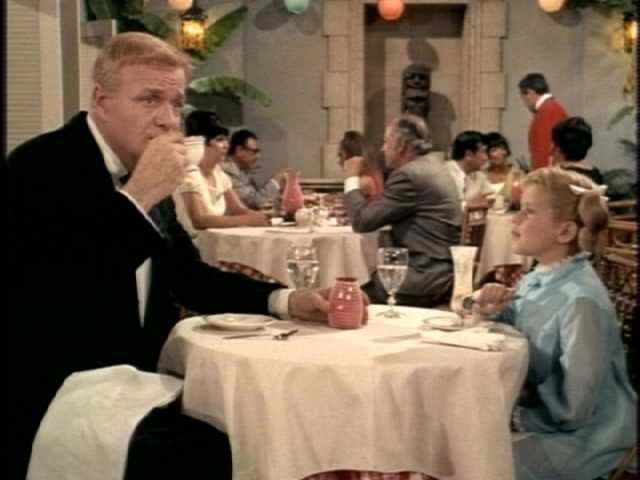 Meanwhile, in Puerto Rico, Buffy and Bill are going to dinner together. 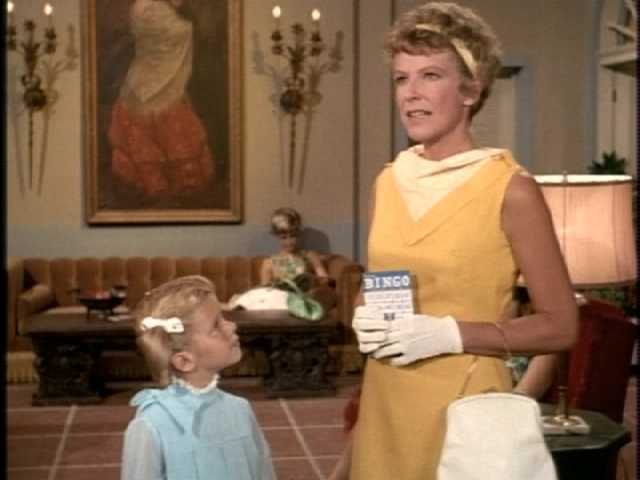 When they come upon Mrs. Robinson in the lobby, she invites Buffy to play bingo after dinner with the other children. When Buffy says she’d like to play, Bill says he’ll come along, too. 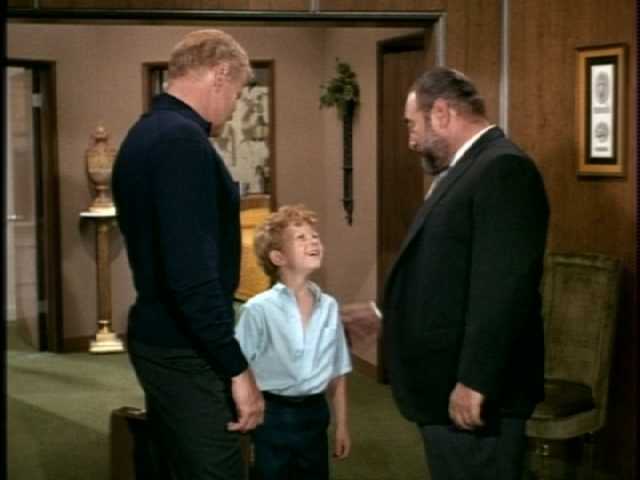 Again, Mrs. Robinson is mystified by a parent who wants to spend time with their child. At dinner, though, it’s clear that Bill’s distracted. This is how Buffy looks as she raves to Bill about her dessert. This is how Bill looks as he stares toward Gail’s table and grunts minimal responses to Buffy’s comments. This is how Buffy looks when she realizes Bill isn’t paying any attention. Letting Bill off the hook, she tells him that she wants to go play bingo without him. “Sometimes kids should be with kids, and grown-ups should be with grown-ups,” she says. She even turns down Bill’s request for a dance and encourages him to dance with Gail instead. Back at home, Marvin has taken Cissy and Jody home–apparently, he barely slowed down the car long enough to let them out. Cissy and Jody have a good laugh about the situation as “Turkey in the Straw” swells up in the background. Bill doesn’t come off well in this episode, from his casual sexism to his inability to leave one skirt unchased. (It’s only a long weekend, for God’s sake!) “Sometimes kids should be with kids and grownups should be with grownups” is a sensible observation, but I wish Buffy had come to that conclusion on her own. She might have become tired of dressing up and being quiet, for instance. 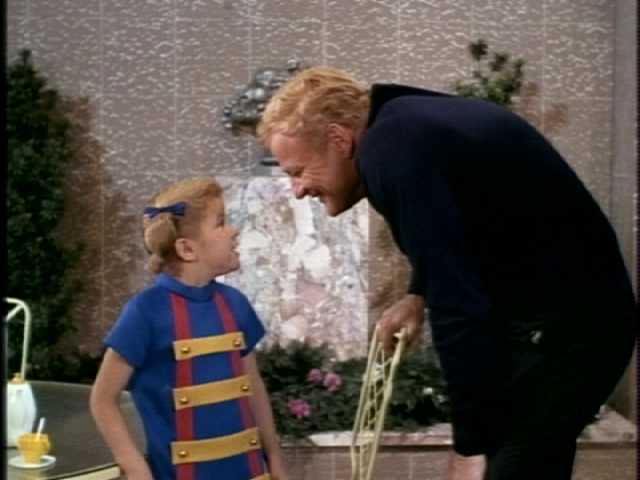 Instead, it’s obvious that she’s just trying make the obviously-checked out Uncle Bill happy. The performances are good, however. 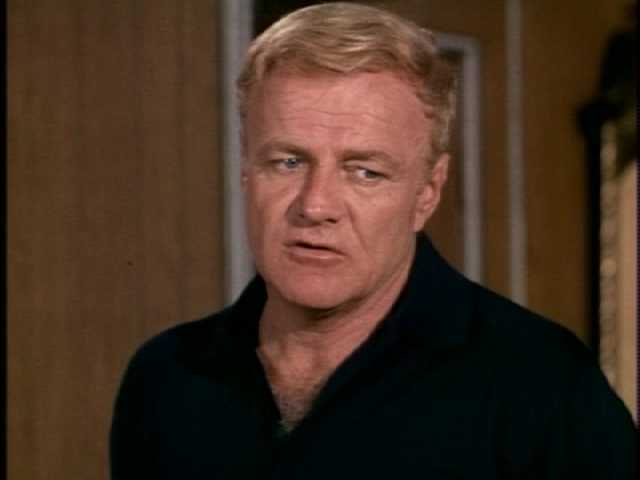 Brian Keith has some nice non-verbal business, which I’m sure he improvised. The playful ear tugging in this scene is a good example. Anissa Jones just beams in her scenes with Keith. The Cissy-Jody subplot is mildly amusing, and I enjoy their laughter at the end. Hotel Clerk: Aladdin. Frank: Barry Cahill. Gail Ryder: Sue Casey. Mrs. Robinson: Patience Cleveland. Marvin: Gregg Fedderson. Mrs. Rodriguez: Carmen D’Antonio. Waiter: Pepe Hern. Maitre d’: Lou Krugman. 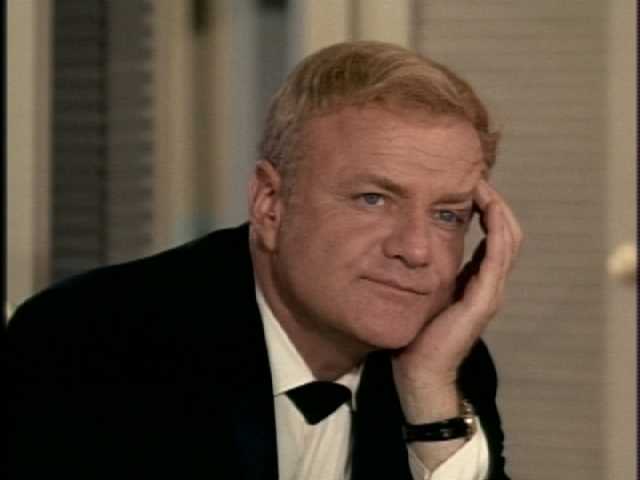 Steve Jackson: Kenneth Tobey. Aladdin played the violin on The Lawrence Welk Show. 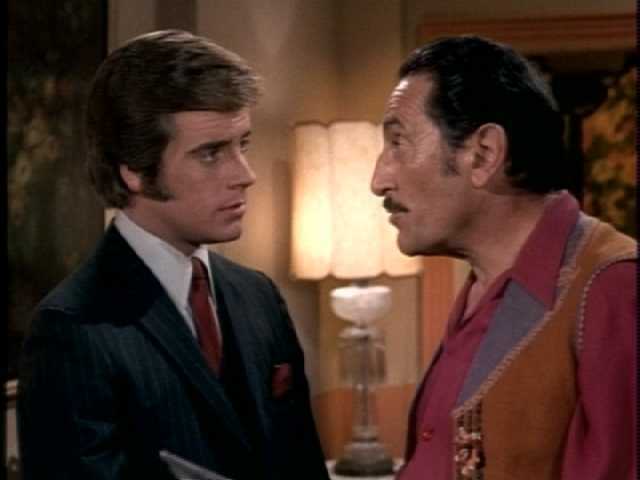 The same year this episode aired, he appeared in a memorable run of My Three Sons episodes leading up to Steve and Barbara’s wedding. 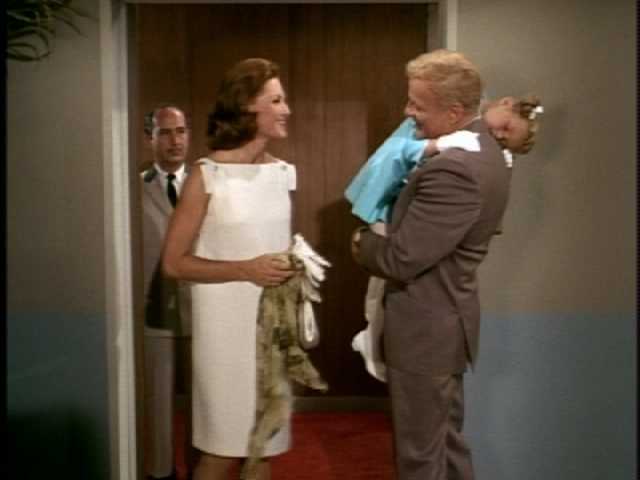 Cahill was married to Rachel Ames (who played Audrey on General Hospital for 50 years). He died in 2012. 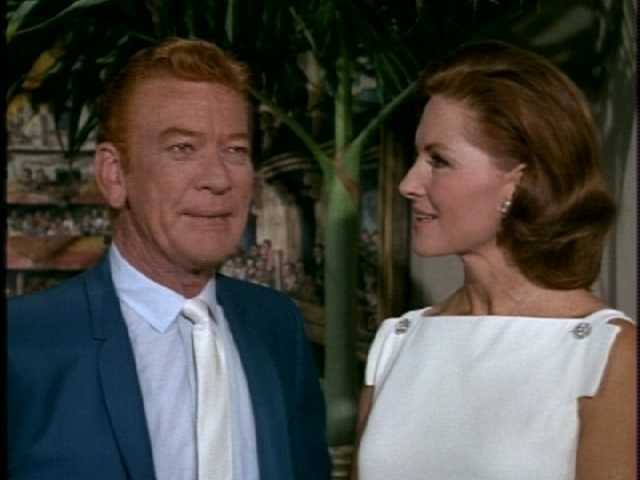 Casey was mostly a Hollywood bit player, but she achieved some cult fame in the 1965 film The Beach Girls and The Monster. 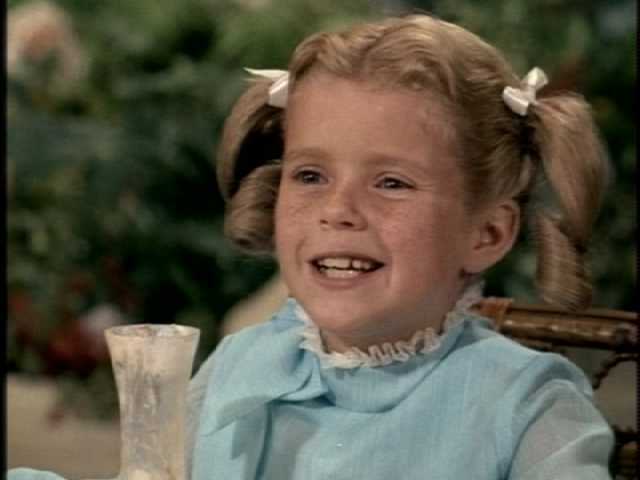 This is Fedderson’s second appearance as a Cissy love interest. The next time we see him, he’ll be starting a string of 11 episodes as her steady boyfriend Gregg. Tobey was a prolific and well regarded character actor. He appeared in The Thing from Another World and many other science fiction films. Other films in which he appeared include Angel Eyes, Billy Jack, and Airplane! In the 1950s, he had his own television adventure series, The Whirlybirds. 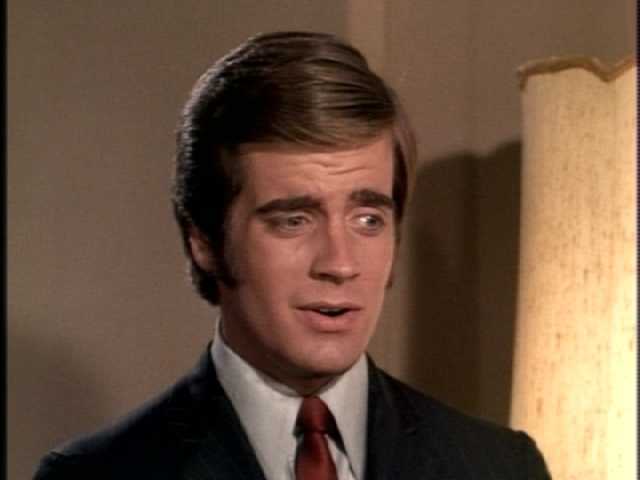 He had recurring roles in I, Spy and Walt Disney’s Davy Crockett series. Tobey died in 2002. 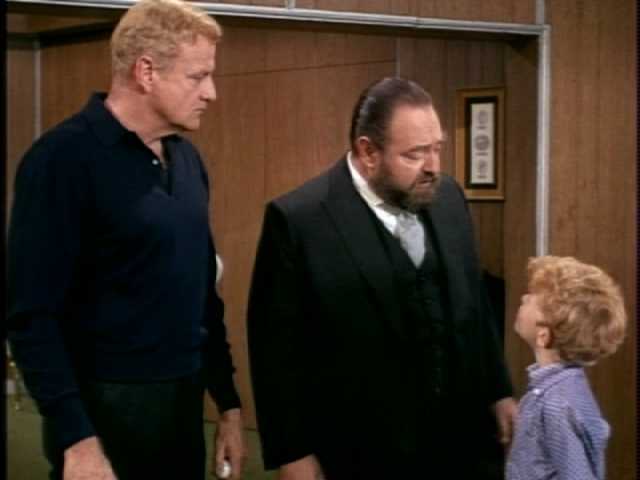 This entry was posted in Family Affair, Television and tagged 1960s, Anissa Jones, Brian Keith, Classic Television, Family Affair, Johnnie Whitaker, Johnny Whitaker, Kathy Garver, Nostalgia, Sebastian Cabot, Television. This is one of my favorite episodes. Buffy listing all of Uncle Bill’s conquests to Gail, and the tag scene with the “Turkey in the Straw” reference are both wonderful moments. It is an enjoyable episode. 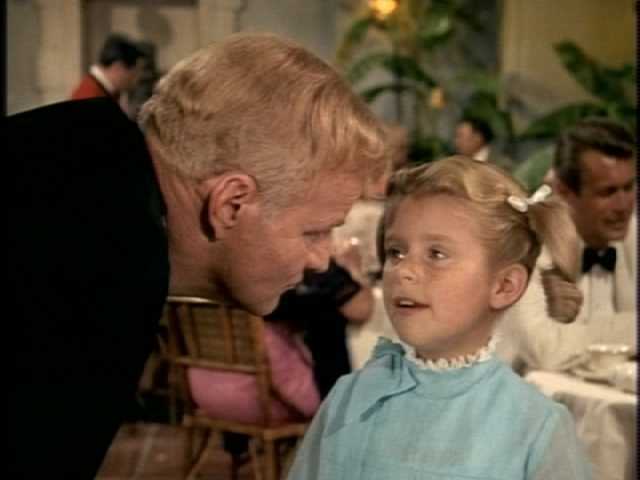 We don’t always see a lot of Jody and Cissy interaction, so the tag scene is especially nice. Buffy listing Bill’s conquests reminds me of a similar scene with Keith in The Parent Trap, but in the movie the daughter was intentionally trying to tweak his girlfriend. Buffy’s innocence makes the TV scene funnier. 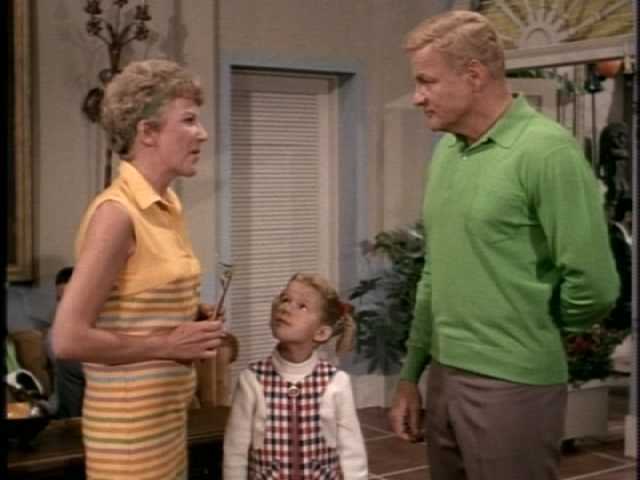 This is one of my fave Family Affair posts. You always make such witty observations, and this is a prime example. I love that Jody requested “Turkey in the Straw”! Brilliant. Glad you like the post! Jody’s role in this episode is cute. He also praises the violinist as playing “almost as well” as one of Jody’s friends–a friend whose parent was driven to the extreme of hiding his violin. Bill’s womanizing is kind of annoying, isn’t it? Apart from hurting Buffy’s feelings with his behavior, why the hell does he have to make sheep’s eyes at Gail all the time although she is in the company of two other guys? And why again don’t these two guys dance with Gail but wait for Bill to ask her? Yeah, the role those other guys play is really strange. It’s like they are taking some kind of vicarious pleasure in Bill’s romancing Gail. Great find! Thanks for bringing this page to my attention. 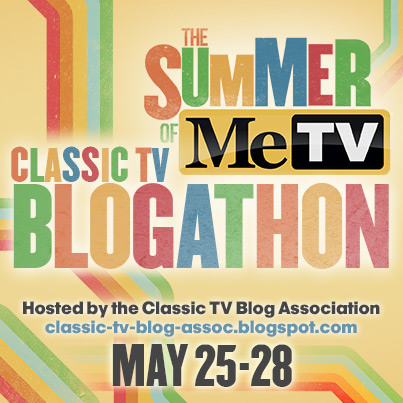 I encourage all my readers to check it out–there are shots from the set of several Season 3 episodes.